In today's world, women have a lot to accomplish, and sometimes family planning takes a side road for a while as more and more women decide to delay getting pregnant until their mid-30s. Because age is the most important factor affecting fertility, understanding how exactly it affects a woman's chances of conceiving is important to make the most out of her reproductive years. Keep on reading to learn more about the implications of women's fertility and age so that you can be proactive about your reproductive health without letting time diminish your chances of motherhood. How are Fertility and Age Related? It is no surprise to most women that fertility and age are closely related, but not many know in what ways. A woman's fertility mainly depends on her ovarian reserve, which is the capacity of her ovaries to provide viable eggs that can be released on ovulation, fertilized by sperm, and develop into a healthy pregnancy. 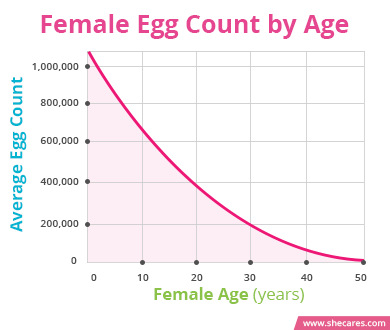 However, like all other cells in the body, women's eggs age, resulting in a natural decline in their count and quality. This term refers to the number of eggs in the ovaries. Women are born with a lifetime supply of eggs, and the body cannot produce more throughout their life. At birth, ovaries contain between 1-2 million egg cells, which will degrade until puberty. At puberty, girls have about 350,000-500,000 eggs in the ovaries. Mensuration. From puberty until menopause, up to about 1,000 eggs will be recruited to be matured during each menstrual cycle, in which one egg will be released on ovulation. At menopause, the ovarian reserve is down to zero, and women no longer ovulate nor conceive. It refers to the potential of the eggs to be fertilized, implanted, and developed into a healthy fetus, which is determined by their DNA composition. Over time, there are chromosomal (DNA) changes in the eggs due to sicknesses, fevers, toxins, and other factors. An egg with such abnormalities is not viable and will cause a series of complications if it is released on ovulation day, including not being fertilized, failing to implant in the uterine wall, or leading to a miscarriage or birth defects in the fetus. 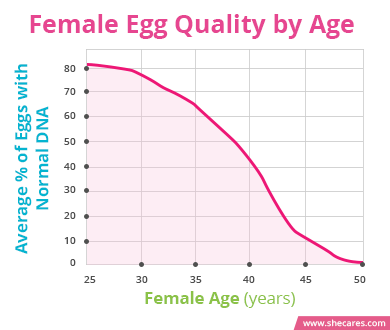 Usually before 30, women have mostly normal eggs with a few abnormal ones. Between 30 and 40, the percentage of abnormal eggs starts to increase while normal egg count decreases. After 40, women have mostly abnormal with very few normal ones. Now that we understand what factors play a role in a woman's fertility, let's put that into perspective and take a look at fertility rates by age. It is important to mention that these are statistical estimations. The odds of getting pregnant can be affected by other factors, such as medical conditions, ovulation problems, or partner's sperm quality. 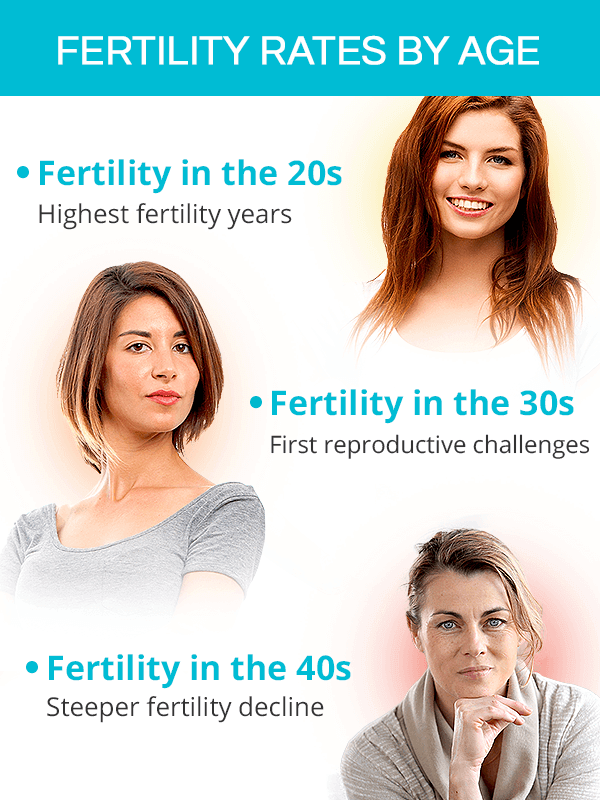 Women in their 20s enjoy the highest fertility, with 24 typically being quoted as the peak fertility age. Their egg pool is abundant, and most of their eggs do not have chromosomal abnormalities, both of which guarantee heightened likelihood of conception. Before the age of 30, women have a 25% chance of getting pregnant in a given menstrual cycle. About 96% of those younger than 25 and 86% of those approaching 30 will get pregnant within a year of trying. Miscarriage rates are low, around 10%. Turning 30 is when many women start being aware of possible fertility limitations. Although late 30s come with some new challenges, generally pregnancy in this age range is still very much possible for most women. Chances of getting pregnant for women younger than 35 are still high. Every month, there is a 20% chance of conceiving for women in that age group. Over a 12 month period, it is estimated that 86% of women 30 to 34 years old will get pregnant. Going into mid- and late-30s, women's odds of conceiving are lower, but still good. There are some important considerations to take into account. Fertility at 35 might become an issue as the decline in ovarian reserve begins to accelerate at faster rates. This means that although egg count is still relatively high, there are more DNA abnormalities that can complicate egg fertilization and its progression into pregnancy. At this age, a woman's chances to get pregnant within a given cycle drop to 15%. However, 78% of women in their mid- and late 30s conceive within a year and go on to have healthy pregnancies. Mid-30s is also the time when doctors begin talking about infertility. Generally, women younger than 35 are advised to seek help after they failed to conceive after a year of trying. This recommendation shortens to six months for women past 35. 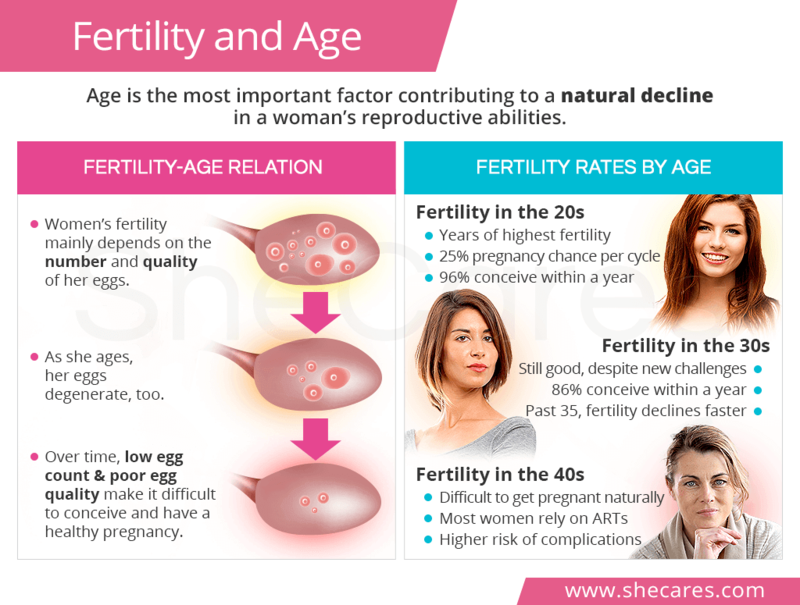 Fertility at 40 takes on a steeper decline. It is not only more difficult for women to get pregnant, but also stay pregnant and have a healthy pregnancy. In fact, studies have shown that in the 40s, fertility declines by roughly 10% every two years. A natural conception is harder, and it might take longer. However, it is still possible for women after 40. Women in this age range have a 5% chance of getting pregnant naturally every cycle. Their odds of pregnancy within a year are 40%, less than half of what it was in their 20s. Miscarriage rates are significantly higher, too, about 34%. More women have to rely on assisted reproductive technologies (ARTs), such as IVF, to achieve pregnancy. Women in their mid-40s typically enter the menopausal transition, during which they might have irregular periods and ovulation problems, making it virtually impossible to conceive naturally. The ovaries contain a very low number of eggs, and most of them have chromosomal abnormalities. Even is fertilization does occur, there is a high risk of pregnancy loss and genetic abnormalities. At this age, the odds of getting pregnant within a year are only 1-3%. Most pregnancies are achieved with the help of donor eggs and ARTs. Miscarriage rates increase to 53%, and the risk of Down syndrome is very high, 1 in 10 pregnancies. Moreover, pregnancy at an advanced maternal age has a higher risk of other pregnancy complications, such as preeclampsia or gestational diabetes. The age-related fertility decline is an inevitable part of being a woman. Her ability to have children depends on whether her ovaries have enough good eggs that can progress into a healthy pregnancy. However, eggs, like other body cells, degrade over time, causing a decline in fertility rates by age. For women in their 20s, these natural processes are barely noticeable; in fact, 96% of women below 25 succeed in getting pregnant within a year. Those in their 30s start noticing first signs of fertility limitations, but still have a good chance of conceiving. Entering 40, however, creates many reproductive challenges as it becomes almost impossible for women to get pregnant naturally. Understanding the relationship between fertility and age is, therefore, necessary for proper family planning and fertility preservation.